Do you know a child who is struggling? Contacting Mercy Home could save a life. Mercy Home’s residential program is for youth between the ages of 11 and 21 who live in situations that place extra stresses on their health and progress. The common thread that connects our children to Mercy Home is that they have experienced trauma and that they are committed to changing their lives. Mercy Home welcomes referrals of young people in need from throughout the Chicago metropolitan area. We evaluate each referred youth for appropriate placement within our full-time residential programs. Our admissions process is designed to ensure that each youth who comes to live at our Home is best served by the resources we provide. Complete our referral form and one of our trained admissions counselors will contact you. If you are a young person or would like to refer someone in the Chicago metropolitan area to Mercy Home for Boys & Girls, please call 312-738-7590. An intake worker will answer your call Monday – Friday, 9:00 a.m. – 5:00 p.m. During off hours, all voicemail will be answered within one business day. 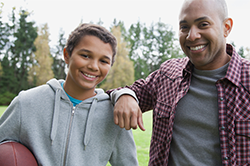 The process consists of four main evaluation steps designed to get to know a young person and his or her primary caregiver(s) as well as possible. This allows us to tailor the process to meet their needs. Additional meetings may be required to further explore challenge areas and to develop a more specific treatment plan. At an informational session, we provide a detailed explanation of our program and ask some questions to get to know the family and young person seeking admission. We know that when you care about a young person in need, you want him or her to be able to move into Mercy Home as fast as possible. Our admissions process is designed to ensure that each youth who comes to live at our Home is best served by the resources we provide. As part of the application process, we need to review key records for each applicant. We request these documents prior to conducting the in-person assessment. During this three to four hour appointment, we conduct in-depth interviews with the applicant and their family. Brief academic testing may occur during this meeting as well. The shadow night allows the applicant to spend the afternoon and evening at Mercy Home, meet the staff and other youth, and gain a first-hand experience of what it’s like at Mercy Home. After all of our steps are complete, we decide whether Mercy Home is the most appropriate level of care for the youth. If a young person is accepted, we will arrange a move-in date. Occasionally, we don’t have space in certain age groups. In this case, the young person will be assigned to an upcoming opening. We do our best to predict when space will become available. Sometimes we determine that a young person needs a different type of program. For those who require a different level of care, we can recommend other agencies that can best address their needs.